Training for Transformation (TFT) Palestine is six month long human rights activism empowerment programme facilitated by some of the world’s leading popular education facilitators to build strength in overcoming the illegal Israeli occupation. TFT Palestine are collabroating with some of the leading social justice movements in Palestine such as ‘The Centre for Freedom and Justice‘, ‘The Popular Struggle Coordination Committee‘ and ‘The Freedom Theatre’ in Jenin. We are currently training activists, educators and organising fundraising programmes across the world to make this programme a reality. We are looking for people to be involved in the organising team, in a small or large way – including volunteers for networking, press, communication, facilitation and much more. 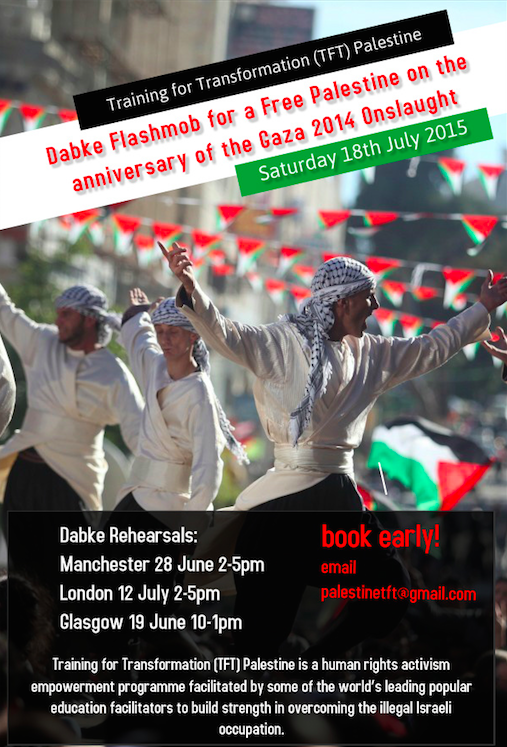 Please register your interest by emailing palestinetft@gmail.com. Participants will learn with the world renowned Training for Transformation (TfT) movement born out of Steve Biko’s ‘Black Consciousness Movement’ and incredible fearless community activists from across Africa. The programme is delivered within an ‘action-reflection’ cycle whereby between the two phases the participant, with support from facilitators, carry out they skills they have learnt in the training to empower their communities and, in the second phase, deepen their skills by reflecting on what was good, and what could be better next time. The research phase is after the second two weeks, where for two months, participants carry out a long term project in their communities to raise critical consciousness and action for strategic change. 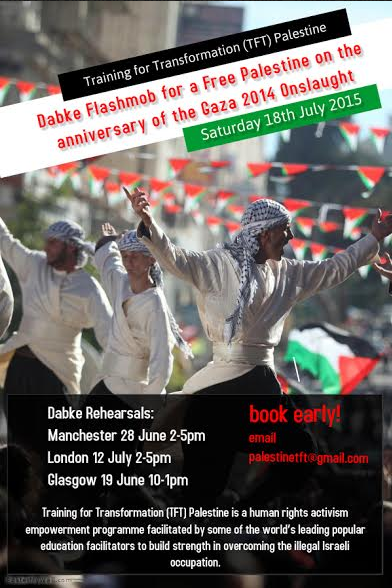 CURRENT PROGRAMME – The ‘Palestinian Dabkeh Flashmob on Operation Protective Edge Flashmob’ will take place across the UK on July 18th 2015 in support of the ‘Boycott Divestment and Sanctions’ campaign. We intend to confront Israeli-Apartheid business as usual armed only with shopping trolleys incredible dance moves. The number of civilians killed during Israel’s Operation Protective Edge offensive has raised international concern and condemnation. Between 8 July and 27 August, more than 2,100 Palestinians were killed in the Gaza Strip, along with 66 Israeli soldiers and seven civilians in Israel. The UN says the vast majority of Palestinian deaths are civilian and many called the attack a genocide. 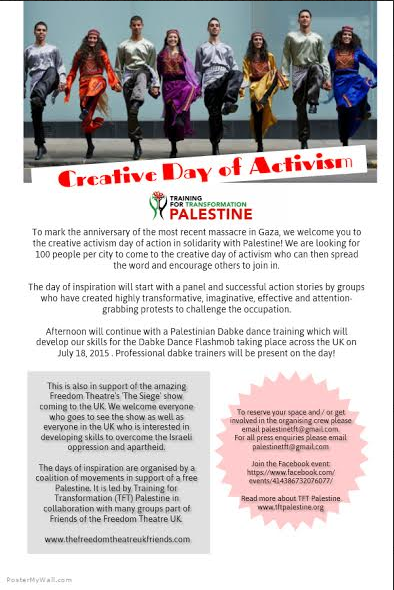 We are looking for 100 people per city to come to the creative day of activism training which includes the Dabkeh Dance rehearsal who can then spread the word and encourage others to join in. The Palestinian dabkeh was traditionally used to scare away evil forces and protect the security and growth of seedlings. A list of key places selling Israeli goods will be shared shortly along with a press and legal brief.